A pair of Blue Topaz and Diamond Earrings white gold. Modern 18ct Blue Topaz earrings. 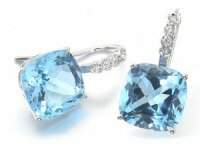 A Pair of Radiant Blue Topaz and Diamond Earrings. Each of these dazzling earrings is set with a Cushion Cut Blue Topaz in a delicate claw setting with a delicate diamond top set with four sparkling Brilliant Cut Diamonds in a rubover setting. All set in 18ct White Gold. 12mm Blue Topaz 15.77cts in total. Diamonds 0.13cts in total. A Stylish Contemporary Blue Topaz and Diamond Ring. 18ct Gold.